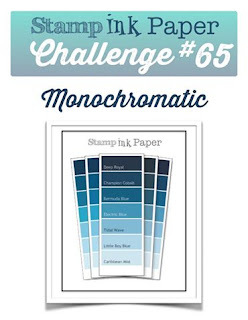 Tina's Crop Shop: SIP Challenge #65 - Monochromatic!! Hello and Happy Tuesday! Of course, as usual, since it's Tuesday, that means I'm back over at Stamp, Ink, Paper with another Design Team Card. This week we have a Monochromatic Challenge! I'll be very honest.. I really wanted to NOT use blue but I couldn't do it! lol I guess I'm just such a fan of the blues.. Maybe it's because I'm from Memphis. LOL Of course, I'm also very much a fan of Nautical cards! So there lies the problem.. how to go Nautical without blue?? This card is a combination of Our Daily Bread Fishing Net Background Stamp, Stampin' Up! By the Tide (sadly retired! ), and Hero Arts Color Layering Goldfish. I really love the sentiment.. Just Keep Swimming from the Hero Arts set! I have a friend at work that is going through some tough times so I thought this would be a great card to give to her for some encouragement. My cardbase is a 8 1/2" x 5 1/2" piece of Mint Macaron scored at 4 1/4", My mat is Island Indigo and I did my stamping on a small scrap piece of Soft Sky. 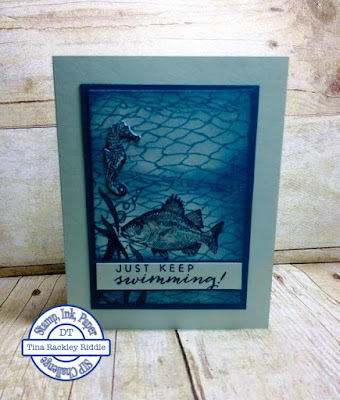 I first stamped my fish from the By The Tide Stamp Set in Island Indigo and then cut a mask of the fish by stamping it on masking paper and then fussy cutting it. I placed the mask over my fish and then stamped the fishing net in Tempting Turquoise. I stamped the seahorse (also from the By The Tide set) in Island Indigo. I then used my Stampin' Up! sponges to sponge on some Marina Mist and then some Island Indigo leaving the darkest around the edges. I decided I wanted the seahorse popped up so I stamped him again on a scrap of Mint Macaron with Island Indigo ink and then fussy cut him and glued him over the other stamped image! My sentiment was stamped in Island Indigo Ink onto Mint Macaron cardstock and backed in an Island Indigo mat.